Hello! I hope your day is going well! I didn't get to my craft room this morning, but I did find play time this afternoon. which is to make a Christmas / Holiday creation. 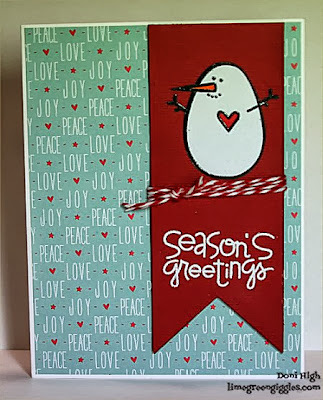 Just love these new paper smooches holiday stamps! I did emboss the Season's Greetings so that it would be nice and bright white. The ways to use it challenge is to use chipboard to create a frame or embellishment. I only had chipboard letters, so I cut 6 red banners all the same size and glued them together. A fabulous card Doni, a lovely design and colour schemem. Your image is delightful and great sentiment and twine!! Less is More....one more time!